Ross Myers got the only goal to dump East Preston Football Club out of the Southern Combination League Division 1 Challenge Cup last night. Myers netted 20 minutes from time to ensure Southwick ran out 1-0 winners in the semi-final clash at Middle Road. The defeat ends any hope of EP completing a memorable double this season, with focus now on their final five league games. 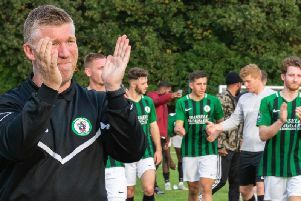 East Preston boss Bob Paine felt conditions on the night made it difficult for both teams and said: "It was a really foggy evening and it wasn't a pleasant spectacle. "It is the same for both teams and credit to Southwick on their victory. The objective for myself and the players has always been promotion and we remain on course still to achieve that. "A cup win this season would have been pleasing but we need five points from our final five matches to ensure promotion. "We recovered from setbacks this season and I'll be wanting a response from my team at Storrington on Saturday." Jared Rance fizzed a couple of efforts wide, while Lukas Franzen-Jones free-kick struck the side-netting in a quiet opening 45 minutes. Wickers then won it 20 minutes from time thanks to Myers' header, which looped over Chris Cook in East Preston's goal. EAST PRESTON: Cook; Josh Parazo, Lyne, Etherington, Jacob Parazo; Hallett, Barnes; Bull, Franzen-Jones, Herbert; Rance. Subs: Huet (Bull, 65), Stevenson, Gilbertson, Laughlin, Purkis.